When I entered the joy in the new year challenge, I only listed currently unfinished projects. I didn't think about all the things I want to make for Christmas! Shea loves the video game Viva Pinata, so when I saw the Alexander Henry pinata fabric online, I instantly ordered some. The scale is larger than I imagined, so I'm not sure how I want to lay it out. I bought some dots to go with it for the front (in orange and turquoise) and some plain dots for the back (at the top of the photo). Now I need to think of a layout! 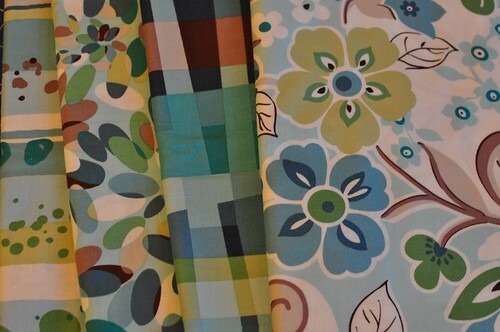 I also ordered some Natural Effects fabrics. I love this collection. And when I saw this, I had to have it too! 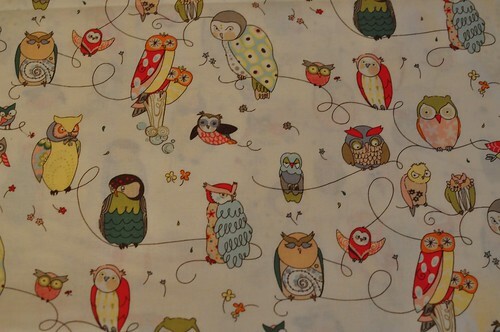 Alexander Henry's "Spotted Owls". So cute! 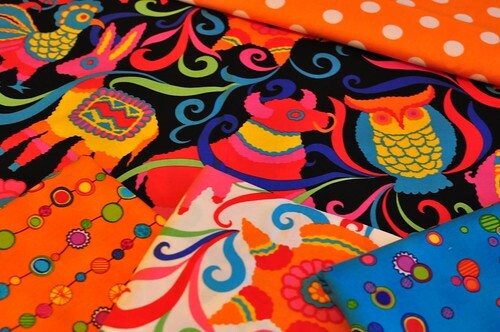 I LOVE the pinata and dots fabric!! That will make a wonderful quilt. So colorful and fun.